Enjoy a scenic getaway to Rottnest Island, one of Perth’s most popular holiday resorts, with round-trip ferry tickets and a guided bus tour of the island. Catch a high-speed ferry from Hillarys Boat Harbour and enjoy dazzling views of Perth on a thrilling 40-minute cruise across the Indian Ocean. 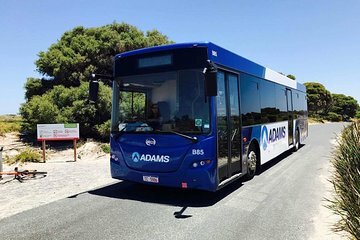 Then, explore the car-free island with the help of your guide, enjoy a buffet lunch (included) at Rottnest Lodge and take in the island’s best bits on a 90-minute bus tour. When it’s time to leave, simply head back to the jetty to catch your return ferry. Great day, good weather. Guide interesting. Wonderful to see the Qokkas with their young. Disappointed in lunch provided, catering mainly for our Asian Tourists, help yourself buffet with limited choice. The bus tour wasn't rushed - had expert commentary and stopped long enough, and often enough, to give us a chance to take in the scenery.